There are no big coronal holes on the Earth-facing side of the sun nthis week. Image credit: SOHO Extreme UV Telescope. Did you miss the auroras of Sept.? Next time get a phone alert: Sign up for SpaceWeather PHONE. QUIET SUN: Solar activity is very low. Strong flares and auroras are unlikely this week. SOLAR ECLIPSE: On October 3rd, the moon will glide in front of the sun, producing a solar eclipse visible from Europe, Africa and the Middle East. The eclipse won't be total, but rather annular, meaning that the moon won't be big enough to completely cover the sun. Observers along the narrow path of annularity (the red line in the map, below) will see a ring of fire encircling the moon--spectacular! On either side of the red line, the eclipse will be partial; the sun will look like a crescent--thin near the path of annularity and fat far from it. Fun activity: Look for crescent-shaped sunbeams dappling the ground through the leaves of trees. It works for dogs, too! warning: Even during an eclipse, looking at the sun can damage your eyes. Practice safe solar observing. 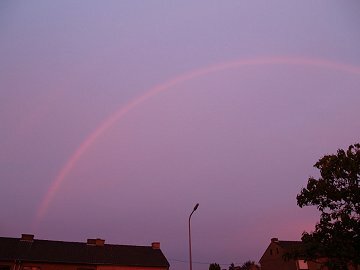 MYSTERY RAINBOW: What does it take to make a rainbow? Two things: raindrops and sunlight. Raindrops act like tiny prisms, catching sunbeams and splitting them into their primary colors. "This red rainbow is a mystery because the sun had set four minutes earlier and was well below the horizon," says atmospheric optics expert Les Cowley. "Furthermore, according to Nolf, there was no rain falling and none visible on local weather radar!" Cowley and colleague Gunther Konnen, a meteorologist, may have an explanation: Thousands of feet above Nolf, the sun had not yet set. (Think about it: "If your flight has ever taken off shortly after sunset you will see the sun rising again as the airplane climbs," notes Cowley.) Somewhere off in the distance, they speculate, a mile-high rainstorm that somehow evaded the radar caught the reddened rays of the setting sun, producing the Bruno's 'bow. You are visitor number 33486994 since January 2000.